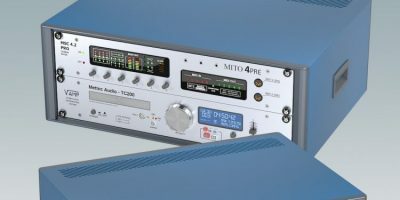 Metcase offers the Technomet 19-inch mini-rack enclosures with a wide range of customisation options. In effect, says Metcase, they can be fully customised to order. The Techomet 19-inch table-top enclosures are designed for mounting standard 19-inch sub-racks, chassis and front panels. Applications include test and measurement equipment, networking and communications devices, sound and studio systems, laboratory instruments, industrial computers and control systems. The standard heights are 3U, 4U and 6U (all 400mm deep) but Metcase now also offers Techomet 19-inch enclosures in custom heights of 5U, 7U, 8U and 9U and in custom depths. In addition, half-width cases (10.5-inch) are also available on request. Metcase also offers bespoke ventilation options. Techomet 19-inch enclosures have a ventilated base and rear panel as standard but can also be supplied with a vented top and/or sides (or no ventilation at all). Tilt-swivel carry handles that double as desk stands are also a custom option available with the Technomet enclosures. The handles are indexable, enabling users to select the best viewing angle for the enclosure. All standard and customised Techomet 19-inch enclosures combine diecast aluminium front and rear bezels, a folded case body and chassis and four snap-on cover trims to create a flush-fitting cohesive design with no visible fixing screws. Inside there are two sub-rack/chassis support rails. All case panels are fitted with M4 threaded pillars for earth connections. ABS side handles are recessed for easy portability. Moulded ABS non-slip feet are also included. Accessories include 19-inch front panels, M6 caged nuts and fixing screws.